The Millennium Problems are in fact the second reincarnation of the idea of important maths problems. At the Paris conference of the International Congress of Mathematicians in August 1900, German mathematician David Hilbert presented a list of 23 unsolved problems that he deemed to be the most important in the world of maths at that time. Fast forward 100 years, in Paris once again, a new list of 7 problems was presented: The Millennium Problems. The seven problems were selected by the Scientific Advisory Board of the Clay Maths Institute, having conferred with leading experts across the world. The main criterion for selection as a millennium problem was that it had to be a classical problem that had resisted solution for many years. One of the most notorious, and the only remaining unsolved Hilbert problem to make the cut, is the Riemann Hypothesis. The Riemann Hypothesis was formulated over 150 years ago and is still as puzzling to mathematicians now as it was in 1859. It relates to a very complicated mathematical function, the Riemann Zeta function, and a proof or disproof of the hypothesis would have far-reaching implications in many fields, especially for the distribution of the prime numbers. A prime number is a number that can only be divided by two factors, 1 and itself. The prime number theorem determines the average distribution of the primes and in general states that they become less common as the numbers become larger. Solving the Riemann Hypothesis will provide a much better insight into how the prime numbers are distributed and while this would be great for improving our understanding of maths, it could be a major problem for internet security. When sending your credit card details and other sensitive information over the internet, the information is encoded by a very large number - 200 digits or so - and to decode this at the other end you need to know what the two prime factors are that make up this number. For example, 15 is the product of 5 and 3, but for a much larger number it is incredibly difficult to work out which prime numbers multiply together to make it. Internet security relies on this difficulty and the fact that we don't really understand the prime numbers very well. Solving the Riemann Hypothesis will therefore greatly improve our understanding of the primes but it could also make our current internet security methods redundant. Our second problem is another one of the more famous Millennium Problems and is often referenced in science-fiction movies by Hollywood directors trying to add credibility to their story. It's the epic battle of P versus NP. While the problem was only precisely formulated in 1971, its origins can be traced back as far as the dawn of civilization to what is now known as 'the travelling salesman' problem. Imagine that you are going shopping and have to visit 5 stores each in a different part of town. What is the fastest route for you to take? Most likely you will already have an idea in your mind, or you will ask google, but the problem can also be formulated mathematically. There are 5 places to visit, which means you have a choice out of 5 for the first place to go to. Once you have visited store one, you then have a choice of 4 places to visit next. Then a choice of 3, then 2 and finally no choice for the last one as it is the only one remaining. Therefore in total there are 5 x 4 x 3 x 2 x 1 = 120 different routes that you can take to visit the five stores. When you ask google to find you the fastest route, the only way that it can be absolutely certain that it is giving you the fastest route is to check all of the possible 120 routes. Computers are very powerful nowadays so this may not take too long, however, suppose you had the same problem, but now you wanted to visit 1000 different places. That means a total of 1000 x 999 x 998 x 997 x ... different routes, which is an astronomically large number and it would take a computer longer than the age of the universe to check all of them. This is essentially the P versus NP problem in a nutshell: if we can program a computer to recognise a solution to a problem quickly, can we also program it to find that solution quickly? For the example above, it is easy to verify if a given route will visit all 5 shops, but much more difficult to determine the fastest route as currently you would have to check all 120 possible routes. P versus NP is asking if there exists a workaround to this problem. Most experts in the field believe that in fact P does not equal NP, but if it is proven that the two are indeed equal, it would essentially mean that it is possible to decode all current methods of cryptography in an instant. As with a solution to the Riemann Hypothesis, our current methods of internet security will become useless. On the plus side, if we were to somehow prove that P = NP, it would lead to huge advances in artificial intelligence and the ability of computers to predict stock market trends. The next problem on the list is a little different and can be seen as rather philosophical in nature. The Yang-Mills existence and mass gap problem enters into the quantum realm - very small scale interactions between individual atoms and electrons. In the classical solutions to the Yang-Mills equations, particles travel at the speed of light. The equations also exist in the quantum world and the theory says that the solutions here should describe mass-less particles known as gluons. However, experimental and computer simulations permit only bounded states of gluons, which have mass. It is this discrepancy that is known as the 'mass-gap' and verifying its existence is the crux of the problem. In some sense, the problem is asking the question 'why do things have mass?' A very philosophical question, but one with a strong foundation built on the underlying physics and maths. In terms of combining physics and maths, it is difficult to find a more unifying problem than the Navier-Stokes equations. This is a set of equations, formulated in the 18th century using Newton's laws of motion, which describe the flow of any fluid. This could be water in a river, air flow around an aircraft or the flow of blood around the body. 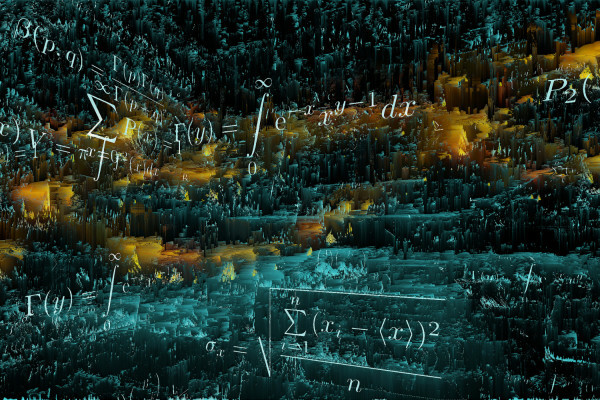 The equations are completely universal in nature and mathematically highly complex. Since the equations are known, and we have solutions to them for a vast multitude of scenarios, you may ask "why is this a Millennium Problem?" It relates to the existence and uniqueness of the solutions. In maths, a problem is 'well-posed' if solutions exist, are unique and don't 'blow-up' (go to infinity). A simple example would be the function 1/x. As the value of x becomes smaller and smaller the value of 1/x becomes extremely large. For example, if x = 0.1, then 1/x = 10 and if x = 0.001, 1/x = 1000. If we let x go to 0, then the value of 1/x will tend to infinity. This is known as a singularity in maths and can cause lots of problems as infinity does not exist in the physical world. Returning to fluids, we can consider the simple example of a bursting bubble. If you take two circular wires with a soap-film stretched between forming a cylinder shape, and then slowly move the wires further and further apart, the width of the cylinder will shrink until it reaches a critical point and bursts. The volume contained within the cylinder has suddenly gone from a finite value to the value of zero in an instant. This is a simple example of a singularity. A proof of the existence and uniqueness of solutions to the Navier-Stokes equations will not only provide mathematical certainty, but will also greatly increase our understanding of the equations and as a result, the motion of all of the fluids around us that they describe. In terms of the three specific examples mentioned above, this could mean better flood defences, faster and more comfortable flight and improved drug delivery in the body. The next two problems are much more abstract in their nature and will appeal to mathematical purists in particular. The Birch and Swinnerton-Dyer Conjecture looks at the equations defining elliptic curves - a particular type of curve that has no sharp corners or self-intersections - and whether or not these equations have solutions that are rational numbers. Rational numbers are numbers of the form a/b where a and b are both whole numbers. For example, any fraction is a rational number, or any whole number is also a rational number as you just set b = 1. The Birch and Swinnerton-Dyer Conjecture asks whether there is a simple way to tell if a particular type of equation has a finite or infinite number of rational number solutions. Next up is the Hodge Conjecture, which is one of the most interesting Millennium Problems, because it is one of the most difficult to define. Depending on which expert in the field you ask, it is likely that you will receive a different explanation as to what the problem actually is. The official statement of the problem on the Clay Institute webpage sums it up perfectly: "The answer to this conjecture determines how much of the solution set of a system of algebraic equations can be defined in terms of further algebraic equations." In other words, given that we know the solutions to one set of equations, how many of those solutions are also solutions to another different set of equations. Hopefully you can see why this is a difficult problem to define. Our seventh and final problem has to be the most exciting of all of the Millennium problems as it is currently the only one that has been solved. The Poincaré Conjecture is concerned with the area of topology - a mathematical concept of breaking down shapes to their fundamental structure. The favourite example of topology lecturers worldwide is that a teacup and a doughnut are topologically the same. Each has exactly one hole, the centre of the doughnut and the handle of the teacup, and if one were made out of plasticine, it could easily and gradually be deformed into the other without creating or destroying any holes. The Poincaré Conjecture is similar in nature. It states that any smooth, finite, shape, that doesn't contain any holes, can be deformed into a sphere. In two and three dimensions, you can perhaps imagine this using shapes made out of plasticine, but the conjecture is much more general and says that this holds in any number of dimensions. Much like in physics there are dimensions that we cannot see, such as time; in maths there are in fact an infinite number of dimensions. The Poincaré Conjecture had been shown to be true in any number of dimensions except the fourth and proving this was the Millennium Problem. Step forward Gregori Perelman. Perelman was a Russian mathematician that took the mathematical world by storm in 2002 when he published his proof of the Poincaré Conjecture online. It took almost 8 years for his proof to be verified and formally recognised by the Clay Institute and in March 2010 he was offered the $1 million prize. The fact that Perelman was the first person to solve a Millennium Problem had already generated intense public interest, and despite him being quoted as saying he "didn't want any fuss" he only intensified the excitement even more by declining the prize money. Around seven years of work (he began working on the problem in 1995, before it was announced as a Millennium Problem) and he did it purely for the satisfaction of solving a great mathematical puzzle; a true mathematical genius. Estimates of the number of hours spent by Perelman working on his proof of the Poincaré Conjecture conclude that the $1 million prize actually works out to be less than the minimum wage. This, coupled with the fact that Perelman declined the prize money, really does show that most mathematicians work purely for the fun of 'doing the math' and I for one, congratulate him on his decision, though personally I would have taken the money and retired a rich man. Fifteen years since the introduction of the Millennium Maths Problems and only one has been solved. The challenge has well and truly been set.